It’s time (even if I am a little late) to publish the statistics derived from the cyber attacks timelines of January (part I and part II). As usual let’s start from the Daily Trends of Attacks chart. The graph shows a constant trend in the first three weeks, followed by a peak in the fourth week and a tail at the end of the month. 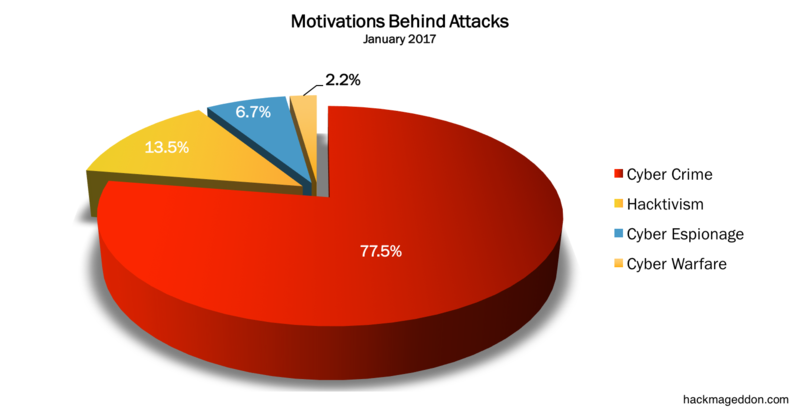 The Motivations chart shows a wide predominance of events driven by Cyber Crime (77.5%) ahead of Hacktivism (13.5%) and, respectively, Cyber Espionage (6.7%) and Cyber Warfare (2.2%). For the first time, the Attack Vectors chart shows a defined category on top (Malware, 25.8%). Normally this chart is led by “Unknown”. Keep in mind that starting from January 2017, I started to include ransomware inside this category. Account Hijackings are always very active and rank at the second place among the known vectors (16.9%), ahead of a surprising spike of targeted attacks (11.2%). The Distribution of Targets Chart is led by Industries (32.58%), ahead of Governments (14.61%) and Educational Targets (12.36%). The Industry Drill Down chart is led by Video Games and Media with 13.8% both. Entertainment (10.3%) ranks at number three ahead of the other categories. The Organization Drill Down chart is not particularly meaningful this month. The pie is equally shared among few categories (Library, Political Party, Health, Non-Profit, and also Horse Racing).